A new year of Scripture Challenges which I always enjoy. If you have not already done so please visit Patter's blog HERE so you can read the thoughts that Patter has shared. This year her challenges will be monthly which suits me well as this year I am doing real paper arts for my artwork on small canvases. I chose to use stars in my artwork because of the star systems being so far reaching and to us they do seem limitless. How wonderful to worship a God whose understanding and His great love is limitless. There are no boundaries to whom He loves and is willing to forgive. To create my art I did enjoy getting paint on my fingers. I used a Gelli Art Plate that I have owned for two years and never used. I did mono printing to create the deep blue metallic with stars paper. I used my oil pastels to create the border around the canvas. The flower was created using some of the printed paper I created. I had intended to use my own handwriting for the scripture and did try it but it looked not so nice as I have shocking handwriting. I am displaying my canvases each month on a very small artist easel. 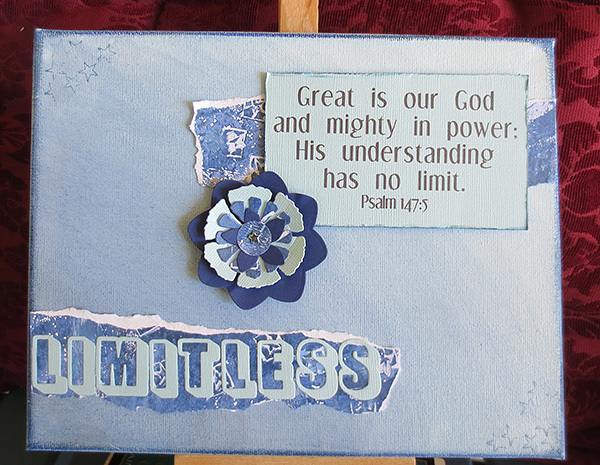 Lovely canvas and stars are the perfect illustration for a limitless God! Your canvas is beautiful! What a fun change of format from you! I can't wait to see more! Beautiful canvas, and such a great verse to use with this challenge!